Dirt is at the heart of natural building. Rammed earth, earthbag, cob, adobe, and natural plasters all use this most accessible building material. We differentiate between dirt and soil since soil contains organisms and decaying matter good for your garden but not the best for building walls. The best dirt for natural building depends on which technique you have chosen, but for a good binding mix Spiritwood likes to aim for 30% clay and 70% aggregate (usually sand). A simple Jar Shake Test will help you determine which ratios of material your dirt contains. Step 1: You will need to fill your jar half full with whatever material you want to test. The goal of this test is to separate the dirt into its main components so that you can measure what percentage of each is contained in your building sample. Step 2: After you have filled your jar half full with dirt, top off the rest of the jar with clean water and tighten the lid down snugly--you definitely don’t want it to be loose for the next step. Step 3: Shake the jar vigorously for several minutes and then shake some more. The tiny clay molecules in your dirt will have naturally coated the sand and silt of your sample. The purpose of shaking is to wash all of this clay loose from the aggregate and then let each component settle to the bottom of your clear jar separately. Step 4: Wait for the dirt to settle to the bottom of your jar. Within the first five seconds, gravel and sand will settle to the bottom as it is the heaviest of the materials and cannot be suspended in the water. Mark this settled aggregate with a line from your marker before the next layer can settle. Step 5: Next will be the silt layer. Silt is extremely fine sediment and takes around a minute to settle completely. Once this is settled, you can once again mark to what height the silt has settled atop the sand/gravel mix. Step 6: Wait several hours--at least--for the clay particles to settle atop the silt layer. Clay is comprised of very fine, very light particles and will stay suspended in the water for quite a long time. Once the clay has settled completely and your water is relatively clear, you can mark the height that the clay reaches on your jar. 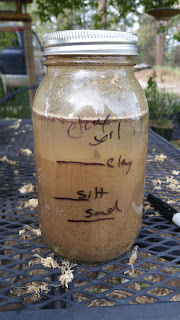 Step 7: Measure your layers to determine what percentage of clay/sand/silt ratios you have in your dirt. 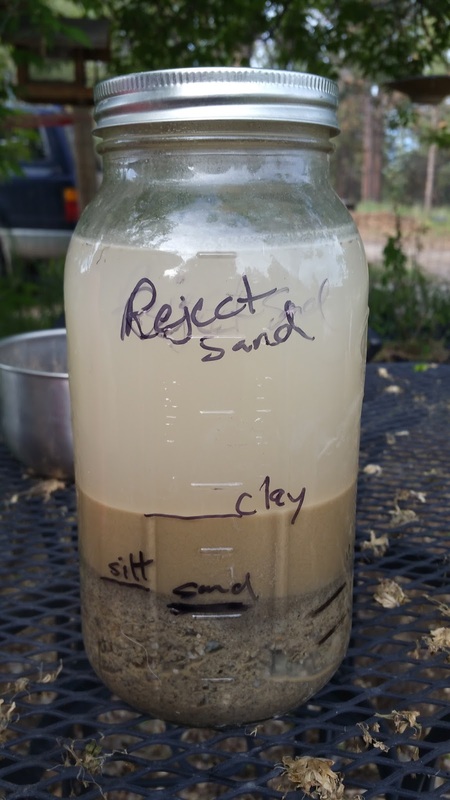 As your can see from the two sample jars that we made, the road base is comprised of sand and much larger pieces of gravel, a small amount of silt, and a moderate amount of clay. 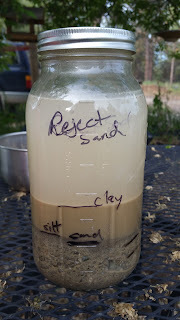 When completely settled, the measured ratios came to roughly 80% sand/gravel/silt and 20% clay. However, the clay soil test at closer to 70% sand/silt to 30% clay. Both of these materials look to be fine for earthbag building. 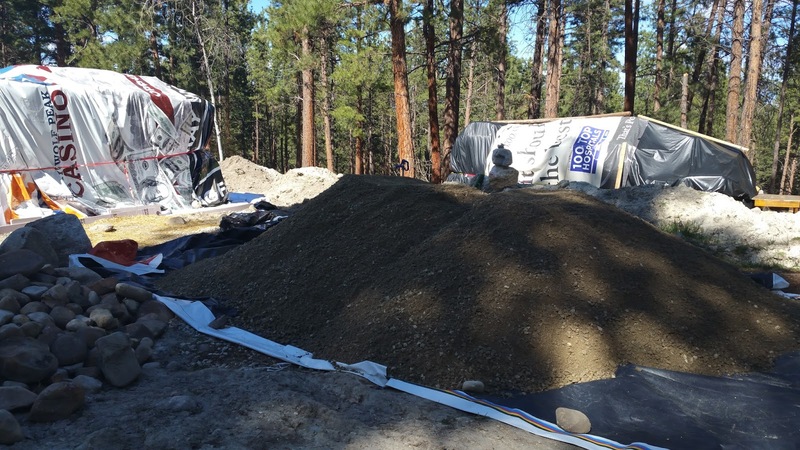 According to Kelly Hart of Earthbagbuilding.com, the superiority of earthbag building is the flexibility in materials usable for construction. Basically any soil comprising of aggregate and clay can be used due to the containment of the bags themselves. However, for cob construction the clay soil would work best due to the higher clay content and the absence of small stone that could be uncomfortable while mixing by foot. The best way to test if your material is suitable for building is simply to do a test. Fill a bag with whatever material, tamp it, and let it sit for a week to see how hard it gets.